In our tour of stellar objects crossing the meridian line this month: two large compact spherical star clusters of old stars in the outer regions of a galaxy, also known as 'Globular Clusters'. M5 can be located in the constellation Serpens. Discovered by Gottfried Kirch in 1702, when he was observing a comet, Charles Messier noted it in 1764, but thought it a nebula without any stars associated. William Herschel was the first to resolve individual stars in the cluster in 1791, counting around 200. 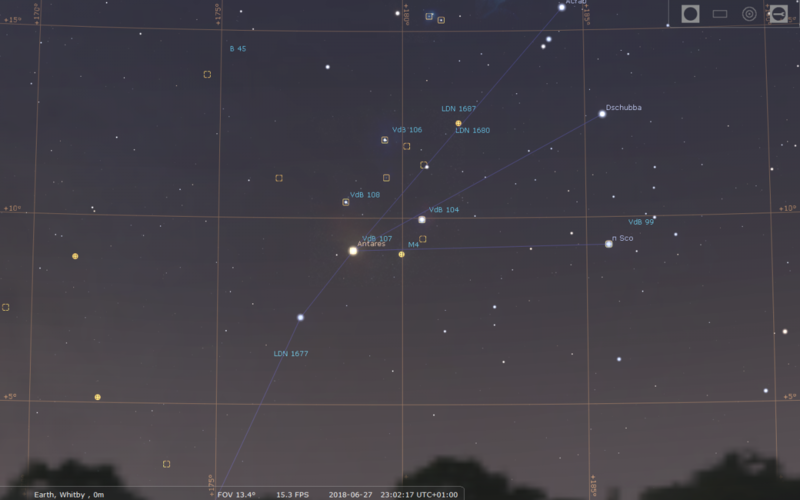 With an apparent magnitude of 6.65, M5 can be spotted with the naked eye from extremely dark locations with good conditions near the star 5 Serpentis. 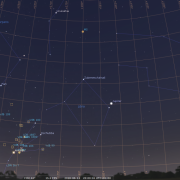 Binoculars or small telescopes will clearly identify it as non-stellar. M5 resides just less than 25,000 light years from Earth within the Milky Way’s galactic halo. Spanning approximately 165 light-years in diameter, M5 is one of the largest known globular clusters. The gravitational sphere of influence of M5, (i.e. the volume of space in which stars are gravitationally bound to it rather than being torn away by the Milky Way's gravitational pull) has a radius of some 200 light-years. Estimates put the number of stars within the cluster around 300,000 of which the brightest have an apparent magnitude of +12.2. 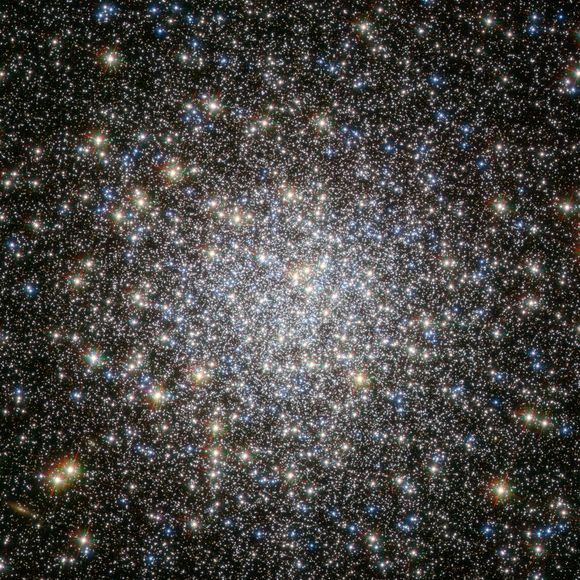 At 13 billion years old, M5 is also one of the eldest globular clusters in the Milky Way Galaxy. Aastronomers have spotted many young, blue stars in this cluster, hiding amongst the much more luminous ancient stars. Known as blue stragglers, astronomers think they were created either by stellar collisions or by the transfer of mass between binary stars. The cluster can be found about a fist-width to the north of Zubeneschamali, the brightest star in the constellation Libra. Individual stars will only appear in larger telescopes, starting with 4-inch instruments, which reveal the cluster’s brightest stars. 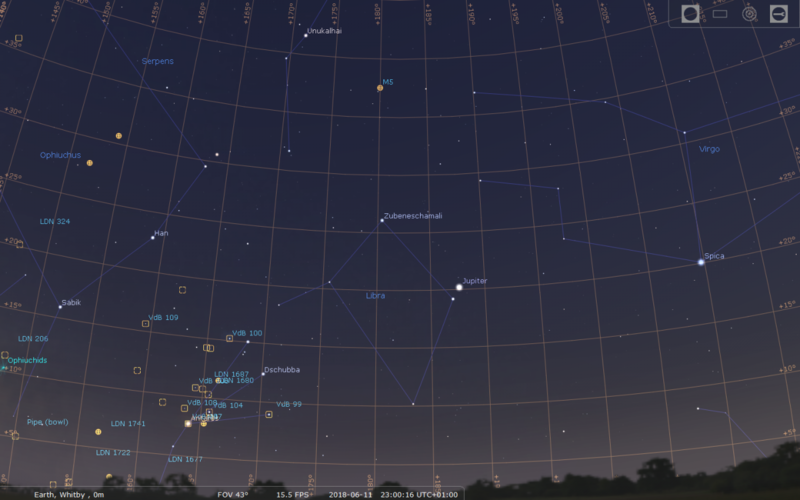 The best time to observe M5 is in April, May and early June. 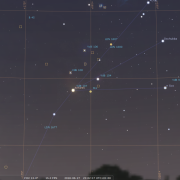 M5 crosses the 180 degree meridian line – due south at 23:00h on June 11th. 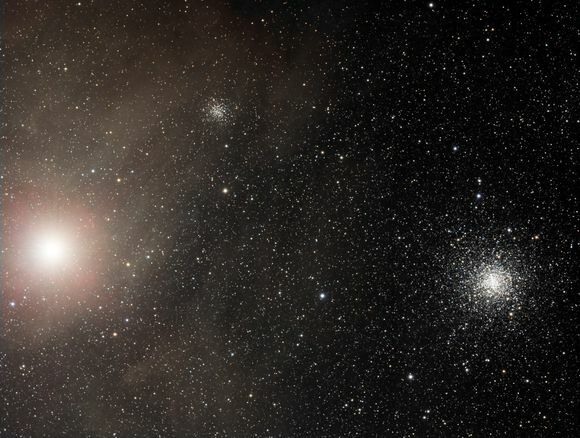 M4 is located in the constellation of Scorpius, 1.3 degrees west of the bright star Antares. 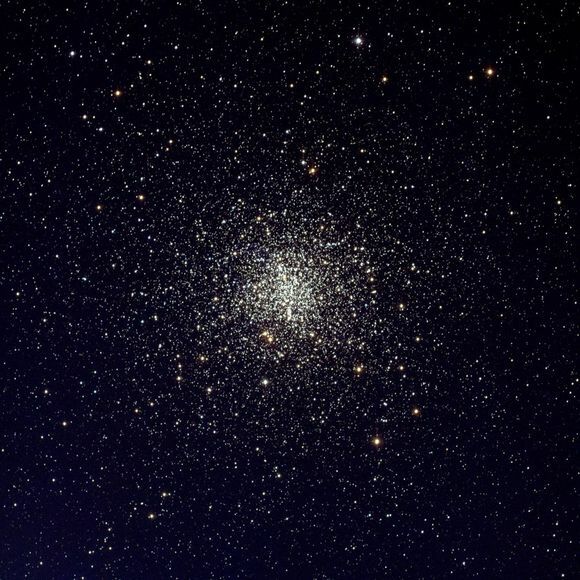 It was discovered by Philippe Loys de Chéseaux in 1745 and catalogued by Charles Messier in 1764 and was the first globular cluster in which individual stars were resolved. It lies at an approximate distance of 7,200 light years from Earth and along with NGC 6397 are the closest globular clusters to Earth. M4 has an apparent magnitude of 5.9 and is conspicuous in even the smallest of telescopes as a fuzzy ball of light. Because it lies just west of Antares, M4 is one of the easiest globular clusters to find, with both objects being visible in a wide-field telescope. Most amateur sized telescopes will begin to resolve individual stars, of which the brightest in M4 are of apparent magnitude 10.8. If it weren’t obscured by clouds of dark interstellar dust, the cluster would appear far brighter.